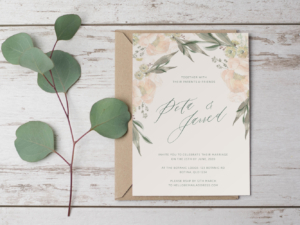 We believe that the wedding invitation process can be fun, easy & creative! 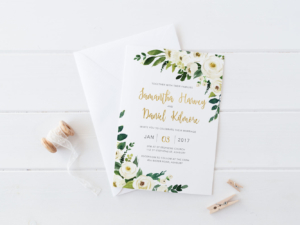 That’s why we lovingly design each unique invitation and provide you with an easy way to get creative and have control over your invitations. With this beautiful DIY printable wedding suite design, you can achieve this. 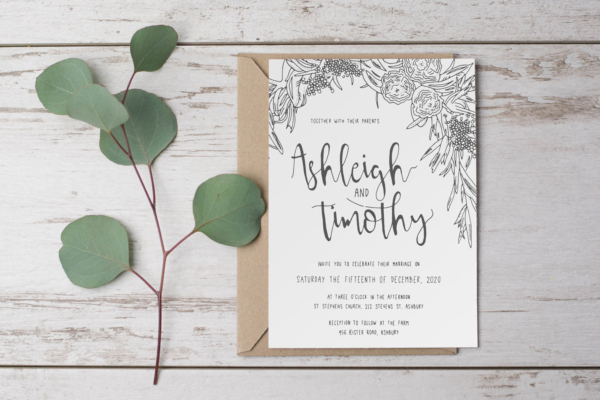 This wedding invitation design features a unique hand-drawn floral illustration designed by Erin. The invitation also features a beautiful script font and hand-drawn style main text (please note none of the text is hand-drawn. However, if you would like a custom calligraphy invitation, send through your ideas and I can let you know a custom price). Please add in the notes section at checkout what sizes you would like each item. A PDF file will be emailed for you to print from home or send to a professional printer. If you would like this design in any other colour/s or sizes, please contact me. 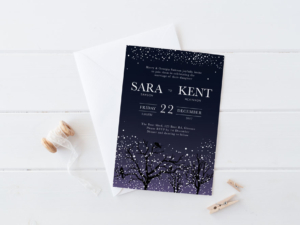 I am available to design custom invitations if you can’t find exactly what you’re looking for. If you have any questions, please feel free to contact me and I will get back to you as soon as possible.